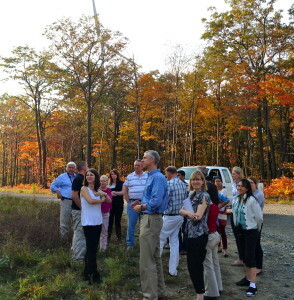 In early October, 2013 I joined twenty fellow members of the National Capital Area Chapter of the U.S. Association for Energy Economics (NCAC-USAEE) on an overnight field trip to a coal-fired power plant, a wind farm, and a coal mine in Western Pennsylvania and Maryland. Aside from many enjoyable interactions with others on the trip, including our hosts, I found the visits both interesting and illuminating from an energy policy perspective. Over the years, I have visited a number of manufacturing plants, which has given me a keener appreciation of the material and human resources employed in producing things of value that we all benefit from. Those of us involved in economic policy too often tend to forget the real people, businesses and communities underlying the numbers, models, analyses and recommendations presented in our studies and reports. For this reason, I looked forward to going onsite of contemporary energy facilities, which have been the focus of much of our work at High Road Strategies. Conemaugh Power Plant. 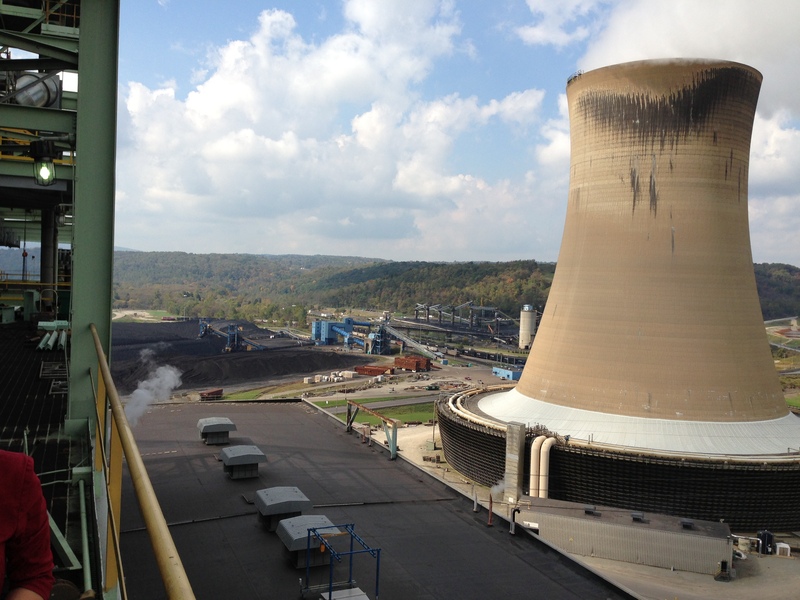 Our first visit was to a 1.9 GW power plant located on a 2,500 site along the Conemaugh River, 13 miles northwest of Johnston, PA. We were treated to a tour of the plant’s main generation and scrubber facilities— including sweeping views from 13-stories up—which have their own fascinating industrial aesthetic (see photos). Operated by NRG Energy on behalf of eight investor-owned utilities, the plant has two 850 MW generating units, each as tall as a 14-story building, that together burn around 4.8 million tons of Pennsylvania coal a year. Built in the late 1960s, with an initial investment of $254.2 million, it went online in the early 1970s. A $330 million flue-gas desulpherization (FGD) scrubber was added in the mid-1990s. It employs 200 full-time workers, most of whom are members of the International Brotherhood of Electrical Workers (IBEW) union. 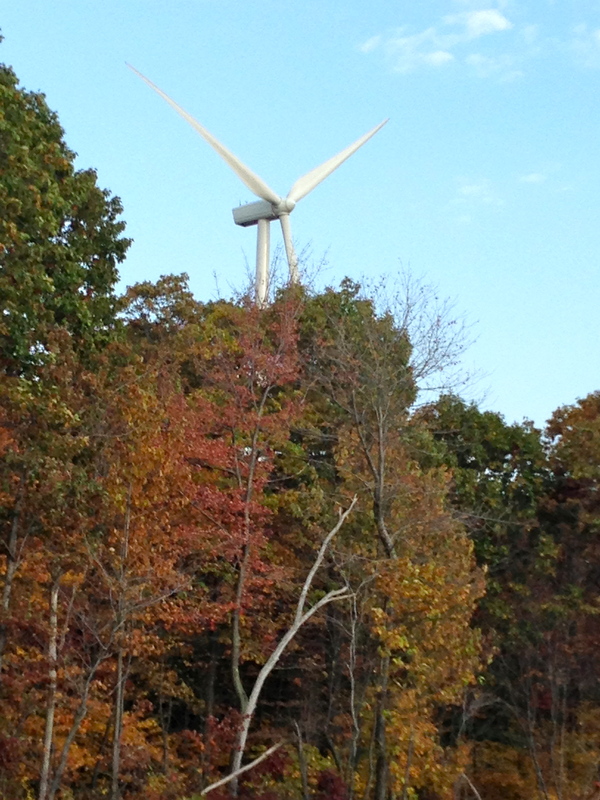 Chestnut Flats Wind Farm. The wind farm we visited shortly after provided a striking contrast to the huge scale and industrial complexity of the power plant. 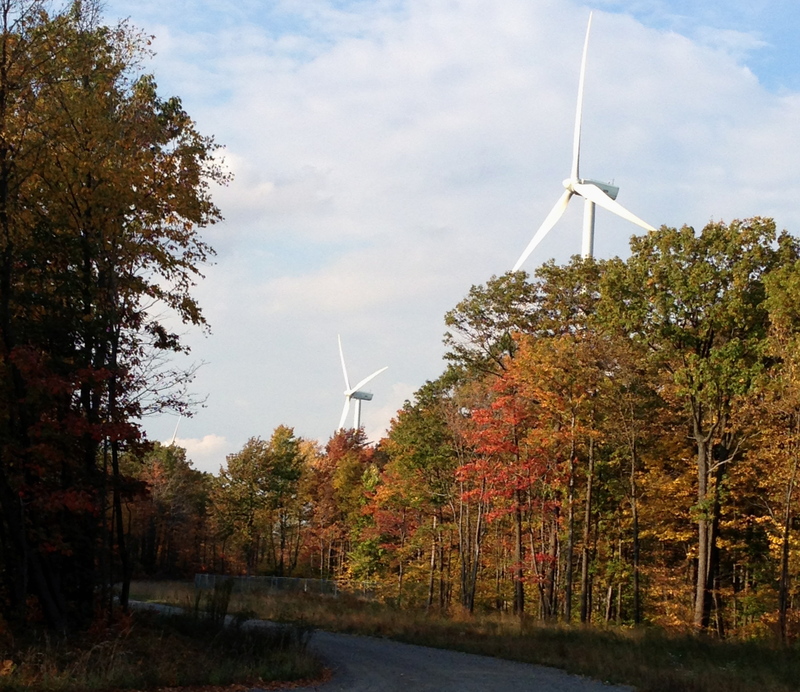 The 38 MW capacity Chestnut Flats wind farm nestled in wooded land, northwest of Altoona, PA, consists of 19 wind turbines, each rated at 2 MW. Built by Spanish-owned Gamesa Energy USA, LLC and owned by EDF Renewable Energy, the wind farm went online December 2011. Gamesa remains responsible for its operation and maintenance, which requires only a handful of workers. The Delmarva Power and Light Company purchases its electricity under a 20-year Power Purchase Agreement. We remained on the ground-level in a wooded area, surrounded by several of the 100-meter high wind turbines with their 44-meter rotor blades in the distance whirling above the treetops (see photos), as we listened to the company guide describe the facility and answer our questions. Safety regulations unfortunately kept us from taking a closer look at the turbines. 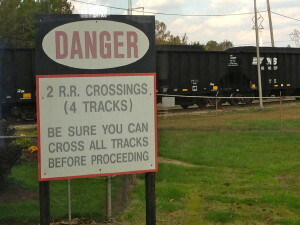 Family-Owned Coal Mine. The next morning found us at a small, family-owned, open-pit coal mine near Frostburg, MD. We walked into a 100 foot deep pit to observe some of the operation that digs out coal from the seams in a hill, mostly sold as metallurgical coal used in steel making and other industrial processes. 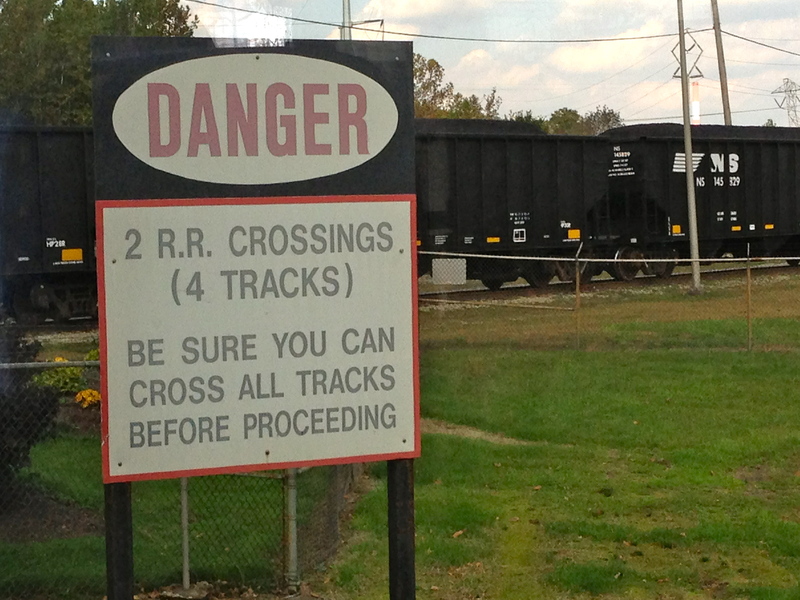 We also were shown remnants of the original underground mine, including two wooden rails used about 200 years ago to move coal cars into and out of the mine. 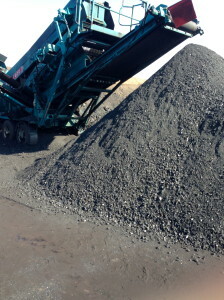 In an unusual moment, a worker at the mine expressed surprise that our group appeared to be “pro” coal. The miner’s comment reflects the sensitivity that many people associated with coal have about efforts over the years to regulate the use of coal in electricity generation, through the Clean Air and Clean Water Acts, and now the proposed EPA regulations on CO2 emissions. Environmental Compliance. Nevertheless, the coal miner’s comments highlighted thorny energy policy issues that I suspect many of us who were on the trip are concerned with. 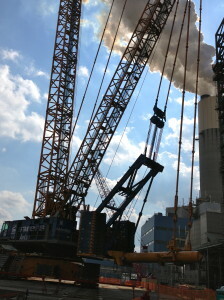 The Clean Air Act has required utilities to install expensive scrubber technologies. 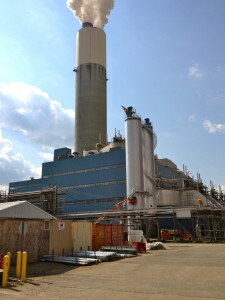 For example, the FGD scrubber facility at Conemaugh, which eliminates 95 percent of SO2 pollutants, cost more than the power plant itself. Another large, expensive scrubber facility is being built, which reportedly would increase this level to over 99 percent. Nevertheless, in 2007, environmental groups filed lawsuits alleging the plant violated the Clean Water Act, polluting the Conemaugh River with potentially toxic heavy metals. The suit was settled in 2011, with the plant owner agreeing to pay $5 million, mostly used for restoring the Conemaugh River watershed. 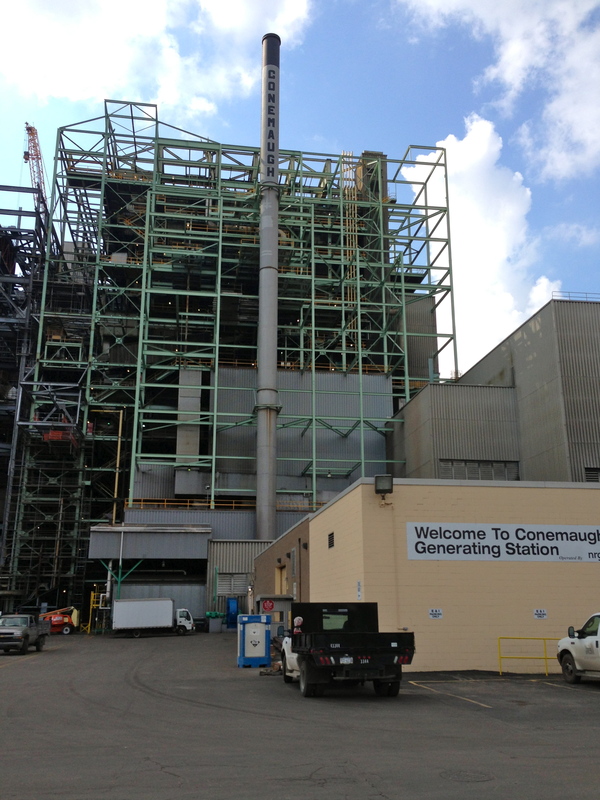 What impact the EPA “carbon pollution” standards, expected to be issued over the next year, will have on the Conemaugh plant, along with other existing coal-fired power plants in the region, remains to be seen. Can these generators make significant reductions in their CO2 emissions and still supply affordable and reliable electric power to the four eastern states and the District of Columbia they serve? Unlike for SOx or NOx, you can’t install additional scrubbers to reduce carbon emissions. Low-Carbon Challenges. The answer depends on how EPA designs and implements the standards. For example, the Natural Resources Defense Council has proposed a combination of measures that would encourage fossil-fuel plants to cut carbon emissions, with potentially less onerous cost impacts. 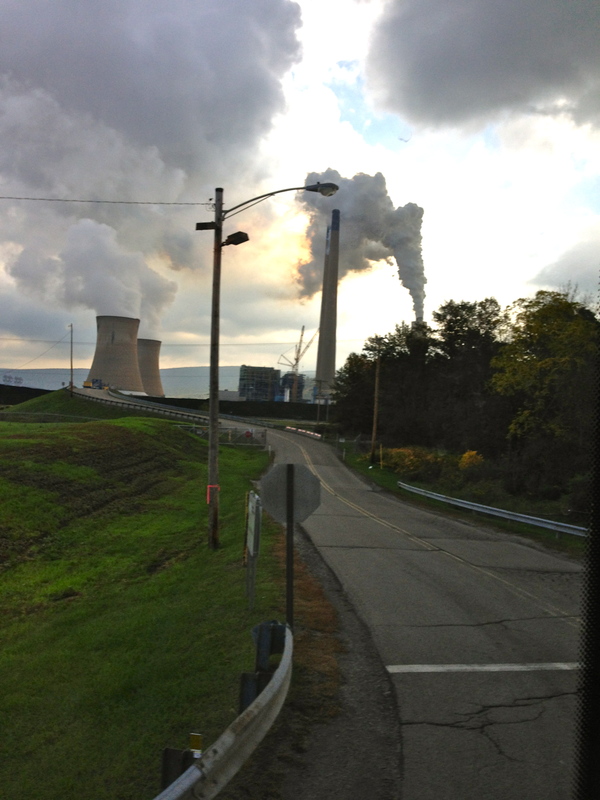 However, transitioning large-scale coal-fired generators, such as Conemaugh and its sister plants, to low-carbon alternatives would present significant technological and economic challenges. 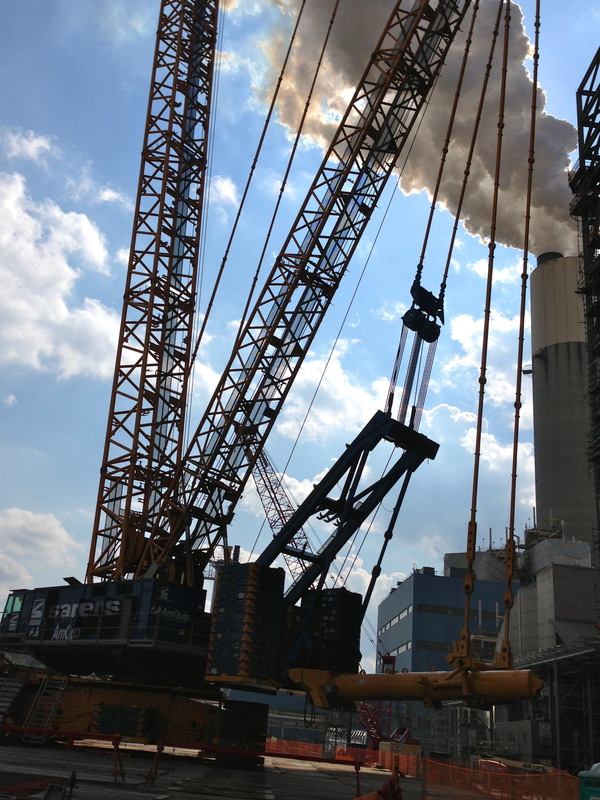 The regulations would encourage plant operators to run coal plants less often, and retire and replace coal plants with natural gas or renewable generation. Individual plants could also reduce emissions by burning a mixture of coal and cleaner fuels (natural gas or biomass), retrofitting with a more efficient boiler, or installing carbon capture and storage (CCS) systems. But these alterations would entail large-scale investments—installing CCS at existing plants would be especially costly—driving up electricity prices for industrial plants, commercial businesses and residents throughout the plants’ service areas. The production costs of energy-intensive manufacturers (steel, aluminum, paper, chemicals) for example could rise if utilities pass along the costs of complying with EPA standards, cutting into profits and affecting their ability to compete in global markets. It also will be difficult to ramp up renewable generation capacity to meet the base load needs of the region. 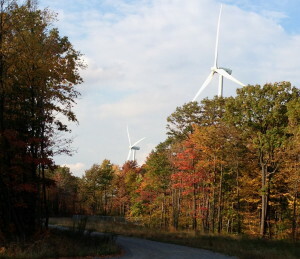 It would take over 40 wind farms the size of the Chestnut Flats facility to equal the nameplate generation capacity of the Conemaugh coal-fired plant, well over 100 to meet its actual annual energy output, and even more to meet peak-period output, because of the intermittent nature of wind and solar generation. However, renewables will be more able to substitute for fossil-fuel base load once utility-scale electricity storage is commercially available. Over the short-term, therefore, many coal-fired power plants are likely to switch to natural gas, which is now much more abundant and inexpensive due to the shale gas boom. This in turn is likely to adversely affect businesses, workers and communities associated with coal mining, transportation and electricity generation. The Clean Energy Path. At a recent event on electric power and innovation in Washington DC, U.S. Senator Joe Manchin (D) from West Virginia, a major coal-producing state, complained of “an overreach by the EPA” in its efforts to regulate carbon emissions from power plants. At the same time, he called for greater collaboration between the federal government and the private sector to support public investments in developing viable, cleaner energy technologies. Manchin’s comments highlight the dilemma confronting policy makers who may support movement towards low-carbon energy sources, yet are also concerned that the path to a “clean” energy economy not be accompanied by significant economic dislocation, job loss, and diminished competitiveness. In future blogs, I hope to examine some of the dimensions of this path, discussing approaches to evaluating and mitigating the negative impacts of clean energy policies, and potential new and expanding opportunities for transitioning into a sustainable clean energy economy. More broadly, High Road Strategies supports the goal of establishing a policy framework for achieving what might be called the “triple bottom-line” of low carbon emissions, energy security, and economic competitiveness. Ideas, and initiatives and prospects for achieving this goal also will be explored. M. Levy, “$5M settlement reached in Pa. coal plant pollution.” Bloomberg Businessweek, June 6, 2011. D. Lashof, S. Yeh, D. Doniger, S. Carter, and L. Johnson. Closing the Power Plant Carbon Pollution Loophole: Smart Ways the Clean Air Act Can Clean Up America’s Biggest Climate Polluters. NRDC Report (12-11-A). Natural Resources Defense Council, March 2013. “Powering Innovation: Technology and Our Energy Future.” Hosted by National Journal, Washington, DC. November 13, 2013. http://www.nationaljournal.com/events/powering-innovation-technology-and-our-energy-future-20131113.